My beloved NoDoz has been off the shelves for almost a year. (Okay, it’s not actually beloved. I don’t love NoDoz the way I love, say, a good burrito, or the way you love a good cup of coffee.) This post concerns a slightly frightening peek into the drug manufacturing business; why I don’t drink coffee; why I value NoDoz enough to miss it; and ultimately why caffeine pills are underrated. I ran out of NoDoz early last spring. First I just figured Safeway was all out. So I went to Elephant Pharmacy, then Rite Aid. None there either. Nobody could tell me why they didn’t have it. Finally, at Walgreens, the clerk referred me to the pharmacist, who said there had been a recall. He didn’t have any details, so I went online. As it turns out, the company that makes No-Doz, Novartis, recalled several of its drugs, including Excedrin, NoDoz, Bufferin, and Gas-X, because it “became aware of … broken and chipped pills, and inconsistent bottle packaging that could cause pills to be mixed up.” One reader commented on the article, “I feel sorry for the people who thought they took Gas-X, but got NoDoz ... Now they’re up all night farting!” But seriously, this could be a big problem because Novartis also manufactures prescription drugs such as Percocet and extended-release morphine at this plant. Imagine a long-distance trucker getting Percocet instead of NoDoz. Another article described the desperate measures some took because of the recall: “Can’t find No-Doz? No problem, just drink more coffee. But migraine sufferers are posting on blogs that they are unable to relieve their massive headaches that are too strong for Tylenol or Motrin. Bidders were running up the price of Excedrin bottles to $50 or more on eBay, that’s how desperate they are for relief.” As the article points out, what these hapless bidders missed is that Excedrin is just a combination of Acetaminophen, aspirin, and caffeine—all easy to find. Their advice to NoDozers, though, doesn’t apply to me. I’ve never been a coffee drinker and am not about to start. Do you remember the TV ads put out by the National Coffee Association in the ‘80s? The most memorable is the one featuring the washed-up rock band Heart. “You are the new American society … the movers and the shakers … you are the new coffee generation! Join the coffee achievers!” As it happened, when these ads came out I was at the age where I could have started drinking coffee. The idea of a drink that could help me achieve was appealing (more appealing at that point than alcohol; no alcohol industry trade association has tried to launch an “alcohol achiever” campaign). My brother did get into coffee, and took to brewing up some pretty thick stuff—the coffee that eats like a meal, you could say. “So are you a coffee achiever now?” I asked him. “Well, I got the coffee part down,” he replied. His coffee didn’t appeal to me and I never did pick up the habit. By now perhaps you’re exasperated. 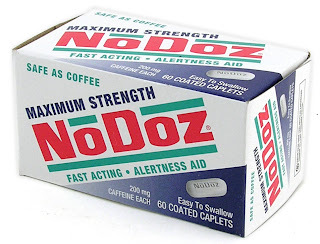 If I don’t drink coffee, why do I mess around with NoDoz? And more importantly, why don’t I drink coffee to begin with, when it’s so darn good? Well, to begin with, I’m cheap, and yet tend toward expensive tastes. For years I never much liked beer, but only because I was sampling Coors and Meister Brau. When I tried good beer (I think Fat Tire, when it first came out, was the eye-opener for me), I liked it right away. That naturally led to an appreciation for Belgian beers like Duvel, and for pricey microbrews (my latest find being Dogfish Head 90-Minute IPA at like $13 for a 4-pack). The only way to keep expensive tastes in line with my Bay Area mortgage is to avoid cultivating an appreciation for expensive stuff like fine wine and coffee. Meanwhile, caffeine is addictive. Of course, so is alcohol, but there’s a difference: most beer drinkers are not alcoholics, while most coffee drinkers are caffeine addicts. An article I wrote years ago about caffeine ruffled a few feathers; some people really don’t like that “addict” label. But I don’t mean it pejoratively; I am talking about addiction not in terms of junkies, but as a simple matter of whether or not your habit involves withdrawal symptoms when you don’t get your beverage. Needless to say, coffee shop chains will exploit this. Consider this article about Starbucks raising the price of a 12-oz. coffee in Manhattan to $2.01 (with tax), forcing customers to either carry change or use a credit card. Asked about this, a Starbucks VP said that “only a small proportion of customers buy just a tall coffee when they visit a Starbucks.” How nice for them. I don’t think it’s overly cynical to suppose that the extra cent is designed to drive customers toward paying with credit, which is known to drive up a customer’s total tab. Without a coffee habit, I avoid that entire retail temptation. Coffee, of course, is much more than an addictive beverage. For so many people it is a life pleasure, and a habit, and often a ritual. The habit and ritual, I’d guess, have at least as strong a pull as the addiction. The guy with his own very expensive Italian-made espresso machine, who grinds his own beans, is at one end of a coffee spectrum; at the other end is Folgers and/or the free stuff you get at the office. I’m not on this spectrum. My use of caffeine is less a ritual than a technique: I use it to boost my athletic performance. “But wait,” anybody with half a clue is saying. “Why not get your performance-boosting caffeine and enjoy a delicious, steaming mug of joe at the same time by being a non-addicted, occasional coffee achiever?” One: like I said, I’m cheap (a NoDoz tablet costs like a dime). Two, I don’t have much time to ride, and if I’m fussing with grinding beans and then waiting for the coffee to drip into a pot, I’m cutting into my riding time. The very prospect of moving quietly around the kitchen brewing coffee at 5:30 in the morning is enough to keep me in bed. But, you protest, the club ride meets at the coffee shop … what could make more sense than grabbing a cup there? Well, brewed coffee isn’t a very precise dose. I base this on an article I read about Starbucks. I gather that Starbucks’ popularity, as with so many chains, derives from its quality control—it must be among the leading chains in this domain. And yet its quality control isn’t actually that good, in terms of predictable caffeine quantity per cup. Maybe that doesn’t matter to a coffee achiever with a tolerance for caffeine, but it matters to me. NoDoz delivers exactly 200 mg of caffeine per tablet. They claim this is about the same as a cup of coffee. (I could swear that when I started using it, the package said it was about the same as two cups of coffee.) But, the article states, “A recent laboratory test [McCusker R.R. ; Goldberger B.A. ; Cone E.J., Caffeine Content of Specialty Coffees, Journal of Analytical Toxicology, Vol. 27, October 2003, pp 520-522] sampled a series of Starbucks Breakfast Blend brewed coffees. The caffeine dose varied from 299.5mg right up to a massive 564.4mg per 16oz cup! What’s astonishing is that the 6 samples were obtained from the same outlet on 6 consecutive days.” Man … 565 mg. If I got that much caffeine I think I’d be hallucinating. Naturally, I wouldn’t blindly assume this study was valid. I like to do my own tests (such as this one) to see how such reports match my own experience. You might assume that my own bias might skew the results of my test. Well, the beauty of this is that I happened to run the tests long before the article came out. I wasn’t drinking coffee pre-ride to measure anything; I just tried it out. Because I keep an absurdly detailed training diary, the results of these efforts are well documented. In both trials, I had a poor performance riding the indoor trainer after drinking coffee. I measure performance by how high I was able to get my heart rate, and how long over my target zone. (In the following accounts, “TAZ” means “time above zone.”) In both workouts I averaged far below the 19 minutes of TAZ I normally get (i.e., when using No-Doz alone). Here are the accounts of my coffee-fueled efforts. I felt I needed a secret weapon this morning and got out the Folgers crystals. I’d never tried it before. I guess my wife’s mom must have bought them in frustration at our not having any coffee around here. So this is in addition to my NoDoz. I already have a strong association between this brand and my workouts, because on the trainer I listen to a lot of rap, including Eminem, who in one song raps, “Wake up and smell the Folgers crystals!” So I figured that literally smelling the Folgers, and of course drinking it, might inspire me to go harder. I know … grasping at straws. Anyhow, I managed to get a bit of TAZ toward the end of this tour, but mostly it just sucked. Meanwhile, I have other anecdotal evidence of the power of pure caffeine. About 2/3 of the way through a brutal 130-mile ride over Mount Hamilton, through Livermore, and back to Berkeley with some guys on my bike club, I was feeling pretty shot and went for a NoDoz. I split it with one of the guys, Steve Kromer, because he’d already been dragging the rest of us around and I hoped to draft him all the way home. This backfired, though: he started to feel so good following the half-NoDoz that he split off from our ride to set off alone on something more ambitious. He rode solo over Morgan Territory Road, then up and down Mount Diablo before returning home over Lomas Cantadas, a brutal climb. He ended up with 170 miles on the day with 15,000 feet of climbing. Was it the NoDoz? Well, I’d seen him drink coffee plenty of times without getting a crazy surge like that.